Everyone has a father. That sounds like a dumb statement at first. And it may continue to sound so. But it seems like it’s just taken for granted. Really think about it: your father had a father who had a father who had a father… and on and on, going back before times were “old school,” past “olden times,” waaaaaay beyond “times of Olde.” It’s pretty amazing, this long chain that is the Cycle of Manhood. When I stare at my kids getting bigger, faster and smarter (one hopes), it’s wild to think they’ll be as old as I am one day. I know I know, it goes without saying. But it still melts my brain. C’mon! Lucas is only two! And even though Cody and Max are pubescent, it’s still strange to picture any of my boys driving, going on a date or making that “you’re crushing my hand” smile as their wives labor to push out the little one that will make me a GRANDFATHER!!! @#$! @%@#$^ ← that’s how you spell the sound of a brain melting instantaneously, by the way. I think about what my dad must think looking at me, as I am now. Once his tiny little gremlin of a son getting into his tools, now I’m all grown up with three little/not-so-little gremlins of my own. 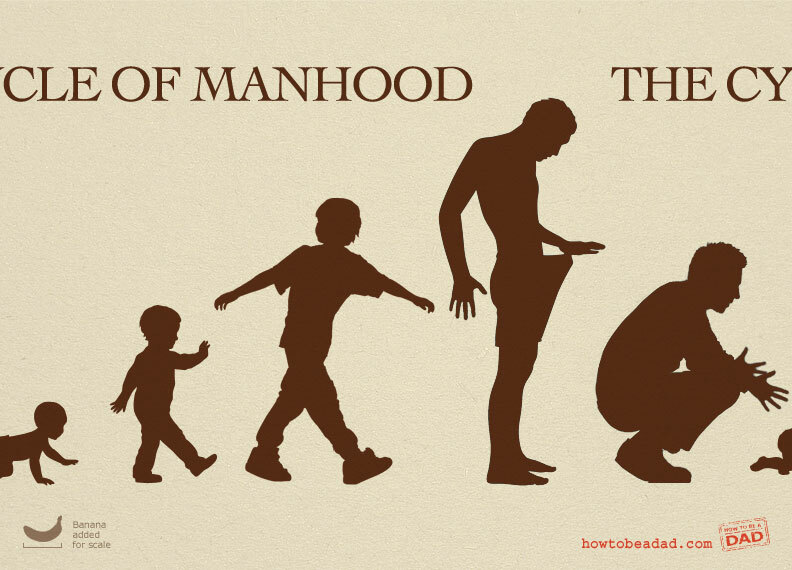 The idea of the Cycle of Manhood gives me a special kind of appreciation for having kids and being a father, and being a son to my dad. We’re part of an ancient and honorable tradition, with a heritage that wheels away into the mists of time further than even the mind can easily see. P.S. Yes yes, I know that all this applies especially to mothers as well, even if it seems like I’m hoarding credit for men/dads. I’m just writing from my perspective, and I don’t think the concept on this Instructional Diagram would have worked as well with a Cycle of Womanhood. If that still doesn’t do it for you, please refer to the domain name of this website for further illumination. No problem, we were boring ourselves. Love the diagram. The cycle really is rather amazing, isn’t it? Magical! Andy as a grandpa sounds like a remarkable thing to see. I’m looking forward to it. You better buy the Howtobeagrandpa.com domain now. Ha ha! I am looking forward to it too in a way. Sitting on a lawn chair sipping lemonade while throwing whiffle balls at all the swarming kneebiters seems to suit me. I WANT THAT! Great idea. Ugh! Love it. And you’re dead on, everything a woman needs to understand a man is summed up in this one illustration. But it’s the essences of things! Ha ha! You and I both know that if I did it literally accurate this wouldn’t be post-able. I’ll never get tired of it, people agreeing with me I mean. I’m incurably addicted but I’m at peace with my habit. Beautiful! And all part of the Cycle. Despite the spoof on Darwin’s “Ascent of Man” drawing, this was intended to be deeper in concept than a materialist’s attempt at a genetic family tree. 😉 Thanks for sharing. Adoptive dads and sons have a home at howtobeadad.com. Is there a Hi-res version of that image for a wallpaper, like 1920×1280 per chance..? It’s brilliant. Thanks so much. All my files are built over-sized but we don’t offer them larger than what we post at the moment. My favorite is the banana added for scale.